Hugo Lloris of Tottenham Hotspur celebrates with Harry Kane and teammates after saving a penalty. 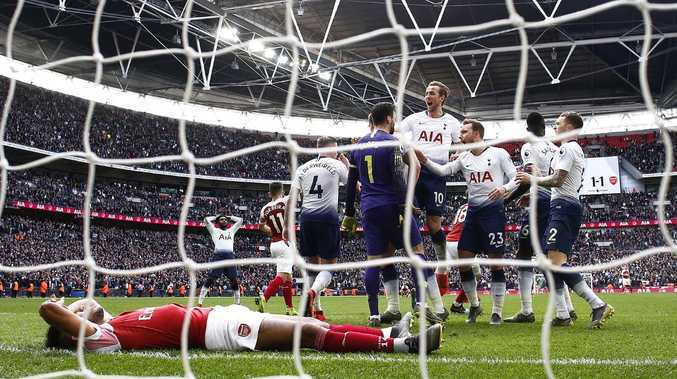 PENALTY drama and a red card ensured a traditionally wild North London derby as Spurs and Arsenal split the points at Wembley. Harry Kane's contentious spot kick sealed the result after Aaron Ramsey opened accounts early. Elsewhere, Manchester City thrust pressure back on Liverpool ahead of the Merseyside derby as they escaped with a 1-0 win at Bournemouth. Romelu Lukaku continued his return to form, netting twice for the second time in as many games to lead Manchester United to a 3-2 win over Southampton. In the battle of the Socceroos, which manifested as a relegation six-pointer, it was Maty Ryan's Brighton who emerged with a 1-0 triumph - all but sealing a ticket to the Championship for Aaron Mooy's Huddersfield. At the opposite end of the ladder, Crystal Palace landed a big victory as they beat Burnley 3-2, while there were also wins for Wolves and West Ham. 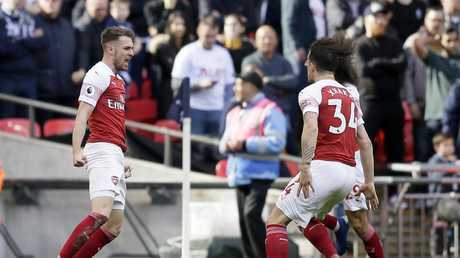 Arsenal led early on through Aaron Ramsey's well-taken goal, but Harry Kane's contentious penalty 16 minutes from time ensured third-placed Spurs maintain a four-point lead over the Gunners in the fight for a top-four finish. Unai Emery's men will reflect on a missed opportunity to inflict further pain on a Spurs side that had lost to Burnley and Chelsea in the past week. Emery made a number of big calls with his starting line-up with Aubameyang dropped to the bench alongside Mesut Ozil even though both scored in Wednesday's 5-1 thrashing of Bournemouth. Manchester City struck the latest blow in the Premier League title race as they moved above Liverpool to the top of the table after Riyad Mahrez secured a 1-0 victory at Bournemouth on Saturday. City climbed two points clear of Liverpool, increasing the pressure on their title rivals before Jurgen Klopp's side face Everton in the Merseyside derby on Sunday. After the single-goal victory against West Ham in midweek, City manager Guardiola could again be satisfied with the way his side stuck to their task to deliver the result they needed at Dean Court. And the way Guardiola celebrated this vital three points with his players on the pitch after the final whistle spoke volumes. Mahrez's contribution was also timely after the Algeria winger had been widely criticised for his display against West Ham, when he was withdrawn after just 55 minutes following his first league start since December 30. 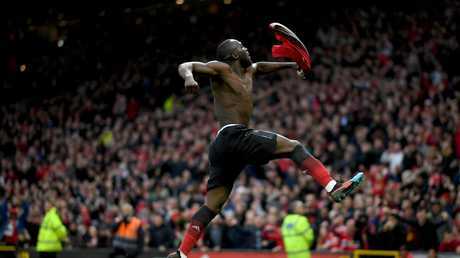 Romelu Lukaku struck a dramatic 89th-minute winner as Ole Gunnar Solskjaer's Manchester United beat Southampton 3-2 at Old Trafford on Saturday to leapfrog Arsenal into fourth place in the Premier League. Solskjaer could even enjoy the luxury of a 95th-minute penalty miss when Paul Pogba's effort was well saved by Angus Gunn following Stuart Armstrong's trip on Marcus Rashford. The win, which extended caretaker manager Solskjaer's unbeaten run in domestic football to 15 games, was much-needed after it appeared United would drop two potentially crucial points in the chase for a top-four finish and Champions League qualification. Brighton grabbed its first Premier League victory of 2019 at the eighth attempt with a 1-0 win over rock bottom Huddersfield on Saturday. The victory halted a slide that had threatened to drag the Seagulls from mid- table at Christmas into the drop zone. Substitute Florin Andone scored the only goal after 79 minutes of a nervy encounter, his fourth league strike of the season giving his side three points they just about deserved. Huddersfield had won for the first time in 15 matches in midweek, but back-to- back victories proved beyond them. Andone, who replaced Glenn Murray in attack, forced a flying one-handed save from Jonas Lossl with a shot on the turn from 20 meters (yards) and then settled the match with 11 minutes to go. 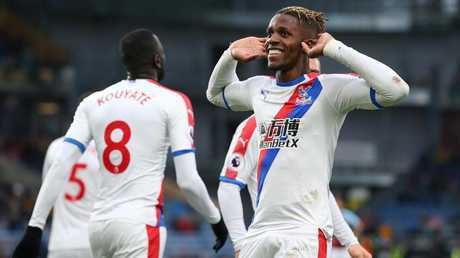 Crystal Palace moved eight points clear of the Premier League relegation zone with a comprehensive 3-1 victory over Burnley at Turf Moor on Saturday. Palace went in front after 15 minutes when Wilfried Zaha jinked his way into the penalty box and crossed for Jeffrey Schlupp, who pulled the ball back and it went in for an own goal off Burnley defender Phil Bardsley's knee. The hosts were then 2-0 down early in the second half after on-loan striker Michy Batshuayi claimed his second Palace goal, converting a center by Aaron Wan-Bissaka. Roy Hodgson's men added a third with Zaha getting the goal he deserved in the 76th minute as he again bamboozled the Burnley defense before shooting under goalkeeper Tom Heaton. Burnley fans were at least given something to cheer when Ashley Barnes headed in an Ashley Westwood cross in the 90th minute. Diogo Jota and Raul Jimenez scored first-half goals in a routine 2-0 win for Wolverhampton Wanderers against relegation- threatened Cardiff in the Premier League on Saturday. The hosts reached a club Premier League points record, sitting seventh on 43 points as they continue to chase Europe, having lost just four times in their last 19 games in all competitions, and reaching the FA Cup quarterfinals in the process. Cardiff has now conceded 10 goals in the last three games and also lost Sol Bamba to injury. Neil Warnock's side remains two points from safety, after a third straight defeat, with Aron Gunnarsson wasting its best chances. A slick 16th-minute move carved the Bluebirds apart as Jota, Morgan Gibbs-White and Jimenez popped the ball about in midfield. Gibbs-White eventually slipped in Jimenez and he squared for Jota to sweep pass the exposed Neil Etheridge from 12 yards. Declan Rice passed his latest England audition with a goal and an authoritative display in West Ham's 2-0 win over Newcastle in the Premier League on Saturday. The central midfielder, who last month switched allegiance from Ireland to the country of his birth, scored the opening goal - a header from Robert Snodgrass' corner - at the Olympic Stadium in front of watching England assistant coach Steve Holland. Mark Noble added West Ham's second from the penalty spot, after Javier Hernandez was fouled, to hand Newcastle a second loss in seven matches. It was fitting that two tenacious midfielders were on the scoresheet on the day West Ham paid tribute to its original enforcer. The club officially opened the Billy Bonds Stand in honor of its former captain and record appearance-maker. The great and the good of West Ham, including Trevor Brooking, Alvin Martin and Brian Dear, gave the 72-year-old Bonds a guard of honor.